DC Comics will release its solicitations for May on Monday at 5 p.m.
For a complete rundown, with cover images, check back here then. The Continuum has obtained the first two images from Painkiller Jane, the television pilot movie for Sci Fi Channel. The images show Emmanuelle Vaugier in the title role. "Based on the Event Comics series, Painkiller Jane is a super-heroine for the new millennium. When Jane Browning is exposed to a biochemical weapon that alters her genes, she becomes endowed with incredible self-healing powers and extraordinary physical and mental abilities. Now, on the run from a sinister organization determined to replicate her powers - or destroy them - Jane joins forces with some unlikely allies to become an ultra-covert crime-fighting agent." The movie also stars Tate Donovan as Graham Knight, a Ph.D. professor who tries to help Jane figure out her new abilities, and Richard Roundtree as Colonel Watts, her commanding officer and mentor. Production on the film is expected to wrap this week in Vancouver, British Columbia. Click on the thumbnails for larger images and look for more on Painkiller Jane soon here in The Continuum. 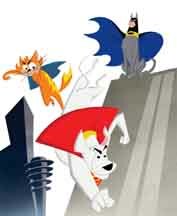 According to schedules released by Cartoon Network on Friday, the Krypto the Superdog animated series will premiere on Friday, March 25 at 9:30 a.m. The show then moves to its regular time period of 9 a.m. on Monday, April 4. 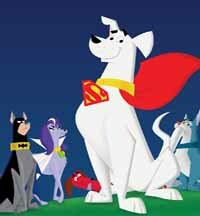 "Krypto the Superdog chronicles the comedic canine adventures of Metropolis' day-saving super dog from the planet Krypton. Krypto jettisons to Earth after orbiting countless years in space as a test-pilot puppy aboard a malfunctioning rocket ship built by Superman's father. 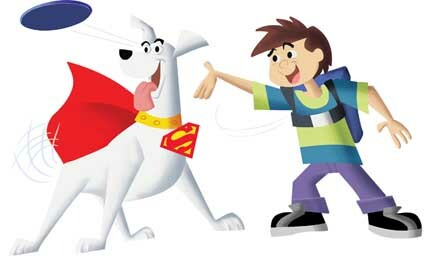 Landing astray on unfamiliar terrain, the fully-grown Krypto swiftly seeks out companionship on Earth and flips over Kevin Whitney, a young boy who also longs for friendship. Endowed with an amazing array of super hero powers, ranging from heat vision to super strength to flying, Krypto, partners with best pal Kevin to fight evil forces that threaten the safety and well being of the people and animals of Metropolis." * The new schedule also reveals that The Batman, which has been airing on Kids' WB!, will debut on Cartoon Network on Monday, April 4 at 8:30 p.m. The network did not release the first episode's title. * Justice League Unlimited and Teen Titans will be all repeats from Feb. 28-April 4. Episodes of Justice League Unlimited include "Ultimatum" on Saturday, March 5; "Dark Heart" on Saturday, March 12; "Wake the Dead" on Saturday, March 19; and "The Once and Future Thing, Pt. 1" on Saturday, April 2. * Here's a first look at the Nancy Callahan action figure from NECA's upcoming line based on the Sin City movie. Click on the thumbnail for a larger image. The film is also featured in the newest issue of Entertainment Weekly. * Kilian Plunkett and Serge LaPointe are the artists for DC Comics' adaptation of Batman Begins. * Pressman Toy is developing officially licensed games and puzzles based on the Fantastic Four movie. * Coming Monday: DC news and more! 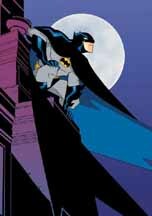 * For Saturday, Feb. 5, including Justice League Unlimited news, CLICK HERE. * For Friday, Feb. 4, including Marvel Comics news, CLICK HERE. * For Thursday, Feb. 3, including NYX news, CLICK HERE. * For Wednesday, Feb. 2, including Marvel news, CLICK HERE. * For Tuesday, Feb. 1, including The Simpsons news, CLICK HERE. * For Monday, Jan. 31, including an interview with Constantine's Rachel Weisz, CLICK HERE. * For Saturday, Jan. 29, including Constantine movie news, CLICK HERE.